After landing a first piece of silverware in nine seasons with his fifth FA Cup, Arsene Wenger has reaffirmed his commitment to bring further glory to Arsenal by penning a new three-year deal as the club’s manager. 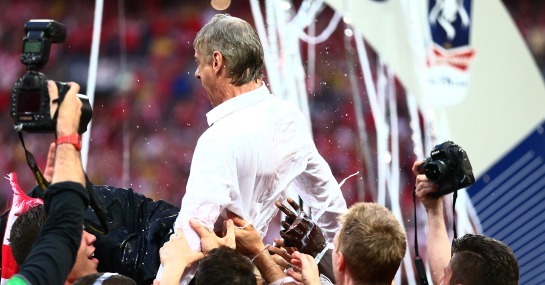 Wenger had remained coy about his future all season, but as soon as he and Arsenal had shaken the gorilla off their back at Wembley it would have been a great surprise if the Frenchman had then walked away. Ladbrokes have reacted to the news in customary fashion and given punters the chance to profit from a series of special bets regarding the next chapter in Wenger’s Arsenal tenure. The bookies offer 1/2 that Wenger, now 64, will retire after he leaves the club where his latest deal will push his Arsenal reign over the 20-year mark. The firm also reckon that the Frenchman can deliver more success within in the next three years, deeming another piece of major silverware a 2/5-chance. However, according to Alex Donohue of Ladbrokes it’s far likelier to be another cup rather than the Premier League title, which is afforded odds of 3/1. Having led the Premier League longer than any other club this season, Arsenal’s challenge eventually faded away due to some damaging defeats to their title rivals. Nevertheless, Wenger sees the next three years as Arsenal “entering a very exciting period” and with a reported £100m to spend this summer another tilt at the league is top priority.